I have reviewed the Platinum Century 3776 fountain pen before, albeit with their amazing 14K music nib. At the time, that pen from any reputable Canadian retailer, would cost you at least $215.00 Canadian, before any kind of taxes or delivery, and without adding anything for the extra cost of the music nib. So, without the music nib, taxes, and let’s be generous and say free delivery, you would still expect to pay around $250 Canadian, maybe a fraction less. I have to point out that this product was on the Amazon.com site, and thus the listed prices are in U.S. dollars, and subject to an exchange rate of about $1 U.S. to $1.3 Canadian (at the moment). 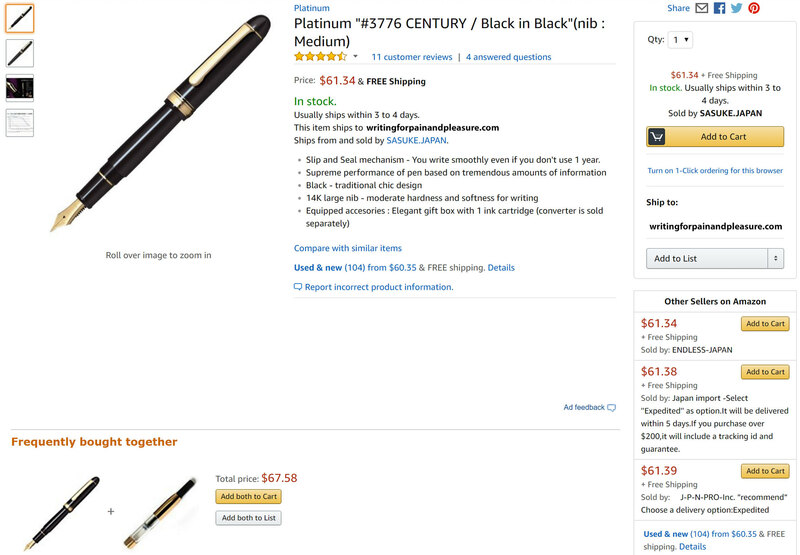 This means a Platinum Century 3776 fountain pen, with a 14K gold (truly excellent) Platinum nib, for about $80 before taxes or customs charges. Let’s add $70 (outrageous I know), for all other charges, and you still get an absolutely amazing pen, for a saving of about $100 Canadian. But for how long will they be there at that price? Who knows? So I ordered mine yesterday. The estimated delivery date from Japan is between the 21st and 28th July 2017; I’ll let you know how I get on. And how I got on is here.